Julie is by far one of the cutest bike commuters out there. Her new hot pink tires on her white Linus have me all kinds of jealous but I don’t begrudge her her lovely bike because she’s such a sweet person that she truly deserves it. 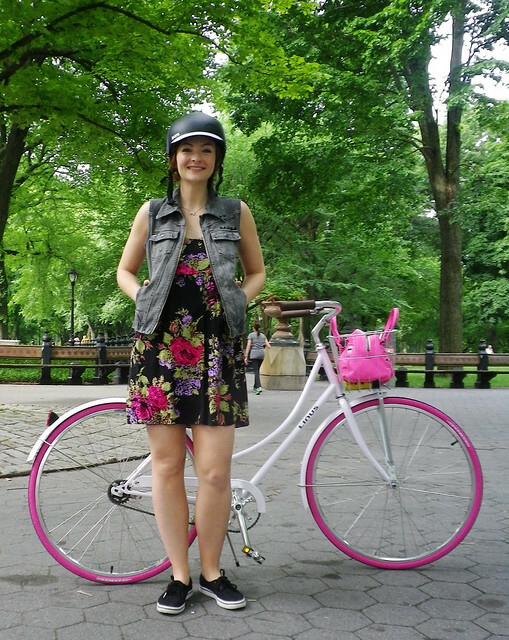 If you’re not already familiar with her photostream, where she records her bike adventures in NYC, or her blog, you might want to check those out this weekend. And if you’re new to cycling in everyday clothes, bookmark her page with savy tips on all the basics that make a bike commute simpler and more enjoyable. I love how she gave her new bike a fashionable look ti match her own sense of style. I read the “Martha” debacle, and am delighted she now has this beauty! You are so sweet for posting about me like this! I hope you had a great weekend! thanks for introducing me to a new bike lady! yay!